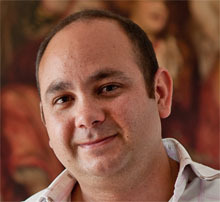 Ehab Abouheif is Professor and E.W.R Steacie Memorial Fellow at McGill University in Montreal, Canada, and is currently Past President of the Pan American Society for Evolutionary Developmental Biology. He grew up in Montreal, Canada, where he did his Undergraduate and Masters degrees. He then moved to the US, where he received his PhD from Duke University in 2002 with Gregory A. Wray, and from 2002-2004 was a postdoctoral fellow with Nipam H. Patel at the University of Chicago and the University of California, Berkeley. In 2004, he returned home to Montreal to join the Department of Biology at McGill University as Assistant Professor and Canada Research Chair in Evolutionary Developmental Biology. Professor Abouheif works at the intersection of ecology, evolutionary and developmental biology, which tries to uncover the rules by which genes and environment interact and how this interaction influences development and evolution. He uses the complex societies of ants as a model to understand the major phenotypic transitions in ant evolution. Dear Ants, what have you done for EvoDevo?